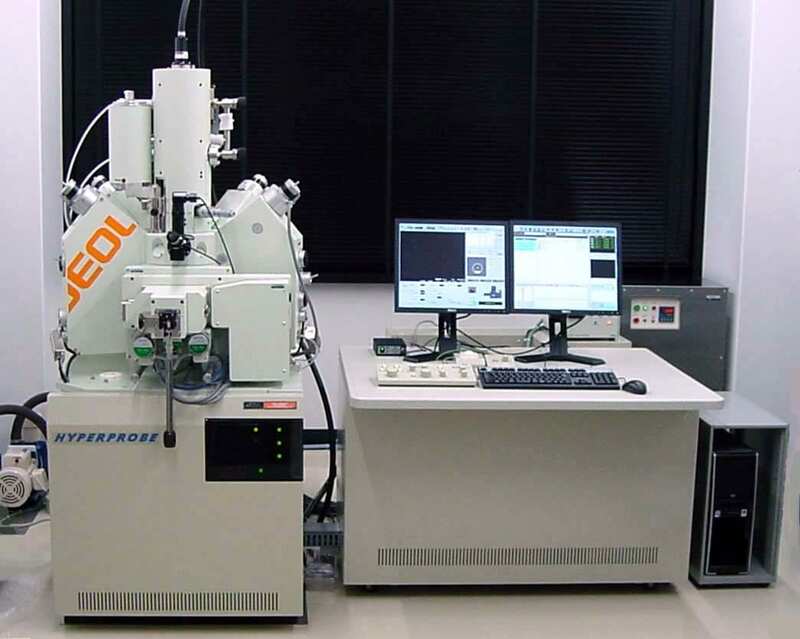 A JEOL JXA-8530F Hyperprobe was installed in September 2015 for non-destructive quantitative elemental analysis of materials at the sub 100 nm lengthscale. The Hyperprobe consists of a field emission gun (Schottcky Field Emission Source), an integrated energy dispersive detector, four wavelength dispersive spectrometers, a secondary electron detector, and a backscattered electron detectors for compositional and topographical imaging. 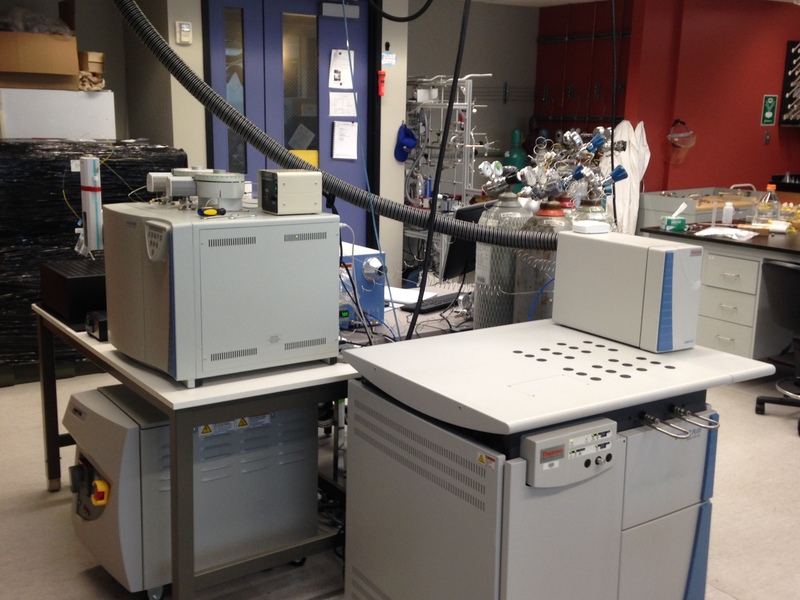 The probe lab is also equipped with a new JEE-420 vacuum evaporator for carbon coating of samples. 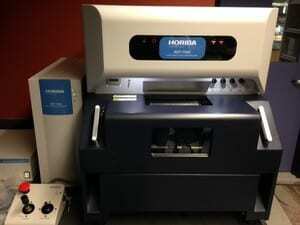 In early 2015, we installed a micro-XRF element mapper (Horiba XGT 7000) in our lab. This instrument excites atoms using a Rhodium x-ray source and measures energy of the re-emitted x-rays using energy dispersive spectrometry. 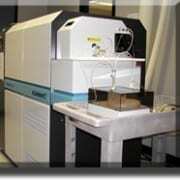 This instrument consists of two monocapillary tubes capable of 50 micron and 400 micron spot sizes. We can operate under high vacuum and partial vacuum, the latter allowing us to measure volatile-bearing samples (such as wet sediments) as well fine sample powder mixtures. This instrument is semi-quantitative and is designed for rapid mapping of large samples (up to 10 x 10 cm) with minimal sample preparation. Built upon principles of flexibility, the 1250-sq. 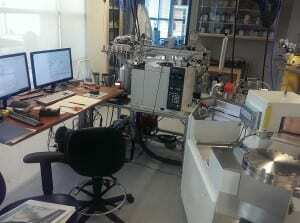 ft. Yeung lab (shared with Jerry Dickens) has two Nu Instruments Perspective IS isotope ratio mass spectrometers and a Thermo Scientific Delta V Plus isotope ratio mass spectrometer (owned by Cin-Ty Lee). In high-resolution mode, the Perspective instruments are capable of performing clumped-isotope analyses of O2 and CO2. They are currently set up to run automated clumped-isotope measurements of O2 in air, O2 dissolved in seawater, and O2 trapped in ice cores. All three IRMS instruments can perform continuous-flow analyses of C, H, O, and N isotopes in a variety of natural materials. We have also set up a semi-automated laser-fluorination + purification line to measure oxygen isotopes (16O, 17O, and 18O) in minerals with high precision, and a high-vacuum sample-handling line for offline sample preparation. Click here for information about fee-for-service analyses on our isotope-ratio mass spectrometers. A Thermo-Finnigan Element 2 single collector, magnetic sector with a 213 nm New Wave laser ablation facility was installed in 2003. Capabilities include measurement of major and trace elements in solution as well as in solids via laser ablation. Our set up allows for both rapid scanning across the periodic table as well as variable mass resolution capabilities (300, 3000, and 10,000). Detection limits in solution mode are in the sub-ppt range and in laser mode are in the 10s of ppb range depending on various operating conditions. In addition to standard major and trace element analyses, we are capable of measuring S concentrations by solution and by laser ablation. We have also developed methods for in situ U-Pb geochronology. Installed in 2002, our department operates an Agilent Vista Pro ICP-AES for analysis of major and minor elemental concentrations in solution. We installed a Thermo Nicolet FT-IR microscope in 2007, capable of transmitted and reflected absorbance down to spatial resolutions of 10 microns. 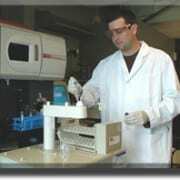 We primarily use this instrument to measure OH and CO bonds in various silicate minerals or glasses. 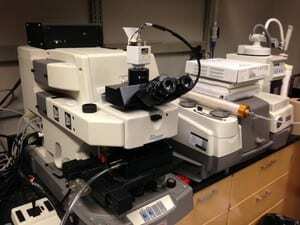 This instrument was acquired with funds from the Packard Foundation. The department operates several wet labs along with a stand-alone positive pressure, hepa-filtered clean room (class 10,000 and 1,000 environments) for preparation of samples. The clean lab (room 328) includes a hepa-filtered laminar flow hood and a perchloric hood. General sample preparation laboratories. Facilities for sample prep include a large rock saw and a shatter box, along with various polishing apparatus, mini-rock saws, and strip grinders. We also have a Franz Magnetic Separator, numerous petrographic microscopes (polarized and reflected light), high precision balances, centrifuges, vortex mixers, and more. We have a 100-sq. ft. walk-in freezer, held at -25 °C, for storage and processing of of ice cores. These ice cores contain air bubbles, trapped after years of snow accumulation, which are snapshots of the past atmosphere. We will use this important air archive to understand how the atmosphere has changed over tens of thousands of years. The lab houses two Rockland Research piston cylinder (PC) devices from with 250-ton (GUPI; picture to the left) and 150-ton (BAGHA; picture to the right) end loads. Both the devices are equipped with fully automated pressure and temperature controllers and are capable of generating pressures up to 3.5 GPa and temperatures up to 2000 °C. 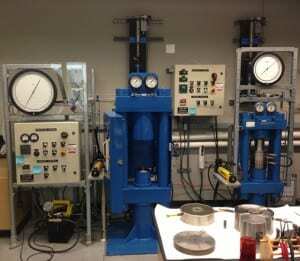 The lab also has a 10-ton press, used for making salt pressure medium for PC experiments and for extracting compressed assembly after experiments. In June 2012, we took delivery of an 1100-ton Rockland Research press, equipped with an octahedral, Walker-style multi anvil module. In this press, currently we are using 12 mm Walker-style castable assembly. The experimental petrology lab also houses a Deltech, vertical tube furnace with gas mixing capability. This Deltech furnace is mostly used for dehydration and decarbonation of starting samples and material synthesis at known oxygen fugacity. Samples can be surrounded by air, inert gas or a CO/CO2 mixture and heated up to 1700 °C. The furnace is equipped with digital mass flow controllers for controlled flow of CO and CO2 gases and a partially stabilized zirconia solid-electrolyte cell for monitoring oxygen fugacity at high temperatures. 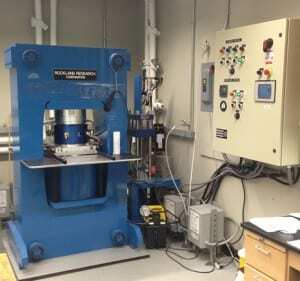 Extensive facilities including a bench-top lathe, high-precision balances, a slow-speed diamond saw, a wire-saw, one abrasive strip grinder, and two rotary polishing wheels are available for preparation of starting materials, machining of experimental assembly parts, and for sectioning and polishing of completed experiments at the experimental petrology lab of Rice University. In addition, Rice also has a Research Support Shop, which is regularly used for precision machining of parts and components for experimental preparation. The lab houses one Zeiss Axioscope 20 petrographic microscope, equipped with both transmitted and reflected light source, an MRC 5 high resolution camera, and an imaging workstation. 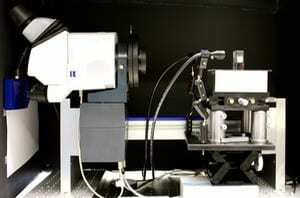 The petrographic microscope is used primarily for documenting textures of polished experimental samples. The lab also houses a couple of Zeiss binocular microscopes for characterization of experimental samples and assembly parts both before and after experiments. Costech ECS 4010 Elemental analysis system, which can determine the C, H, N, and O content of solid samples (soils, marine, riverine, and lacustrine sediments, biomass, etc). HyProp and WP4 soil water potential instruments which can be used to characterize soil water potential curves. LiCOR 7000 infrared CO2/H2O gas analyzer for determination of CO2 and H2O in gas samples. A centrifuge, analytical balances, pH meters, shakers, a nano-pure water system, fume hoods, a muffle furnace, sieves, various soil grinders, and a large drying oven. The department maintains various equipment for offshore studies, including high-resolution seismic and side-scan sonar equipment. Malvern Laser Particle Size Analyzer (LPSA) – Quickly and accurately measures grain size, from clay particles through sand size, using only small sediment samples. The LPSA is used at Rice for projects studying sediments in the Gulf of Mexico, Antarctica, and Northeast Australia.